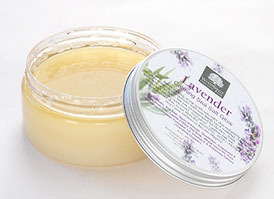 Soothing Lavender is not only calming for frayed nerves, but is healing for all kinds of skin afflictions as well. This wonderful, gentle Sea Salt Glow refines and tones all skin types, while soothing the mind and relaxing the senses. How it Works: WoodSprite Sea Salt Glows are made with finer salts than most of our competitors. This results in gentler exfoliation and smoother skin. Salt Glows work by exfoliating dead cells, increasing blood flow and stimulating skin cell renewal, while moisturizing skin with beneficial oils. Our combination of oils is unique; only the finest exotic nut or fruit oils are chosen for their rich vitamin content and quick absorption. Finally, pure essential oils uplift your spirits while toning and stimulating your satiny new skin! Ingredients: Sea Salt, *Organic Sunflower Oil, *Organic Sesame Oil, *Organic Grapeseed Oil, Organic Castile (*Organic Olive Oil) Soap, Rice Bran Oil, *Organic Apricot Kernel Oil, Pure *Organic Bulgarian Lavender Essential Oil, Vitamin E, Rosemary Extract. (*Certified Organic) Best for most skin types.